as promised last time I start to publish my results from the cycles today. Additionally I made "Horizontal Hang" and "Double Leg Calf Raise from the floor with bent knees" 2 times per cycle and every day the "Trifecta". As you can see I already made a adjustment in the second part of the second cycle. 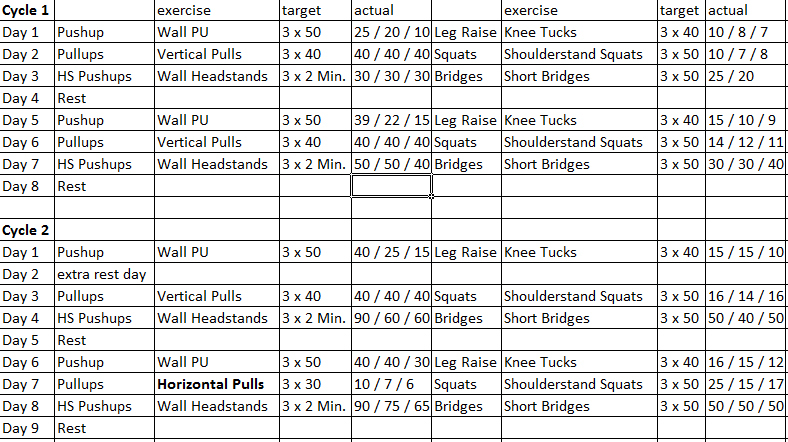 I replaced "Vertical Pulls", which are step 1 of the pullup series, with "Horizontal Pulls", which represent the second step. As I mentioned earlier I'm gonna move forward to the next step once I finished the progression standard 3 times in a row...that actually happened during the two cycles. Honestly, I was a bit surprised about how hard the single exercises (except of "Vertical Pulls") are...caused by the 2-1-2 cadence I couldn't meet the progression standards of the other exercises. But I look forward to the next cycles...I do progress every time and in every exercise so I guess I'm already getting stronger and more used to the cadence (at least I feel like that). In my opinion the most challenging exercises are "Knee Tucks" and "Shoulderstand Squats". I really struggle to perform better with those. "Knee Tucks" giving me pain in my lower back (I guess that's a weak part of my "used-to-office-chairs-back") and "Sholderstand Squats" that are so difficult to me because I can't hold my body in the right position...but even with them I could realize progress every time I perform them again. A last word regarding the "Wall Headstand": The last time my body was upside down was...I can't even remember...but it's pretty simple...due to insecureness I needed six attempts before I kicked off the ground with enough power, but after I made it once I realized that it's really not worth the "fear". Just try it out! If you feel too insecure then ask a friend for help...you'll see that it's not so hard.